The truth is that there is no one way to use social media - social media should tie into the whole organization and connect to business outcomes. Each brand in each vertical might use the same social metrics differently, which is why it's so important to look at specific industry subsets, and see how the best social marketers are using social metrics to drive their brand forward. For pet food marketers aiming to maximize the value they get from their social marketing, this is an essential read. 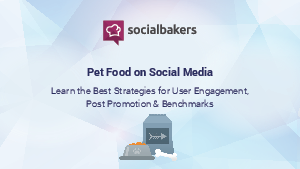 We cover promotion strategies that show pet food brands how to optimize their content's reach and engagement, giving condensed, bite-sized action advice for those of you looking for one quick takeaway.